Pierre-Emerick Aubameyang and his possible move to Arsenal has dominated the headlines in Germany. On Monday it was reported by some media outlets that the Gabonese striker has already agreed on personal terms with the North London based club. Dortmund in the meantime have told the press in Germany that they are not commenting rumours, but it is understood that a negotiation team, which includes BVB’s former head of scouting Sven Mislintat, is in Dortmund to negotiate a deal. Media is also suggesting that the clubs are currently still separated in their evaluation of Aubameyang with Arsenal currently offering €60 million and with Dortmund wanting at least €70 million. There are also rumours that Dortmund would like to loan out Arsenal forward Olivier Giroud until the end of the season as an immediate Aubameyang replacement. As discussed on the latest Futbolgrad Network Gegenpressing Podcast Giroud alongside Krasnodar’s Fedor Smolov and Racing Club’s Lautaro Martinez are among the favourites to be signed by Dortmund. 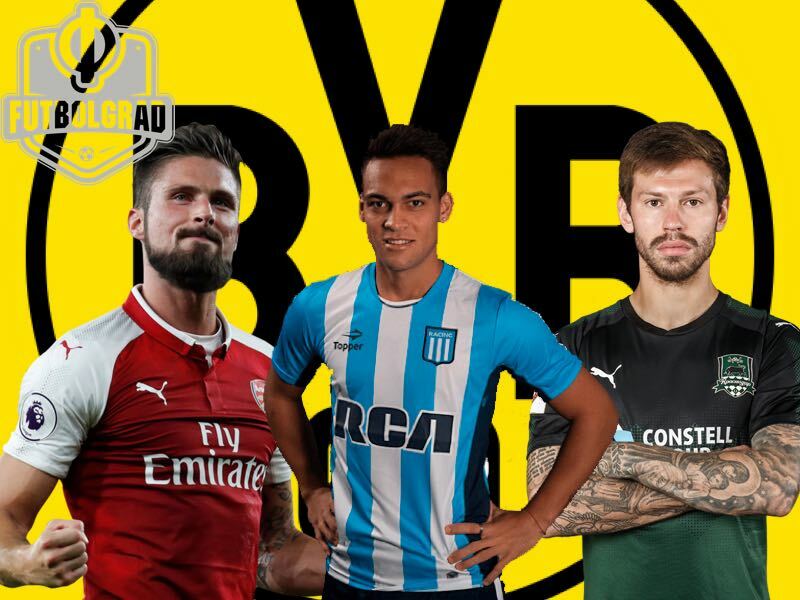 With a deal fast approaching the Futbolgrad Network has looked at who could come in and replace Aubameyang in the short-, and, in the long-term, as well as how Dortmund could change their strategy on the transfer market as the club is moving into a new era. 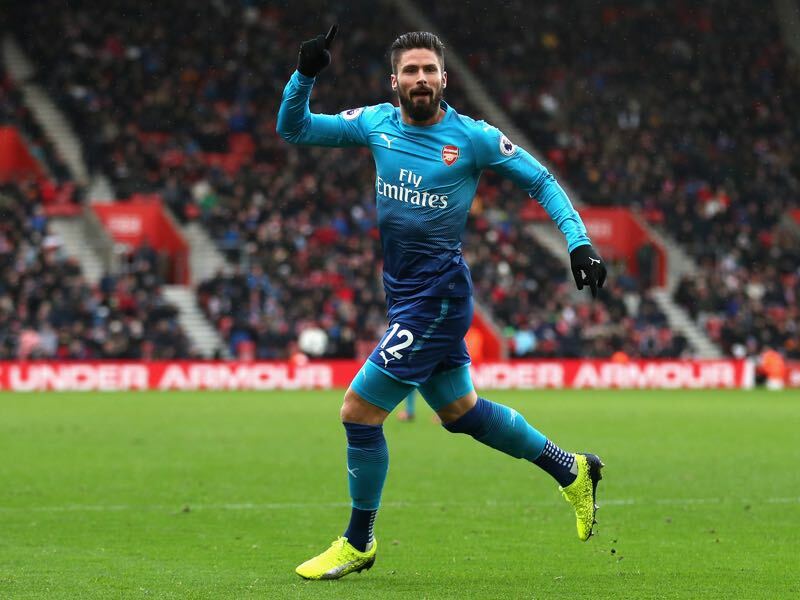 Oliver Giroud appears to be favourite in the short-term to replace Aubameyang. The French striker seems to be unhappy with his playing time at Arsenal, who have signed Alexandre Lacazette this summer from Olympique Lyon. With Lacazette in the squad, Arsenal have added an all-out goalscoring threat, which makes a possible Aubameyang transfer to London a little confusing. Further adding Aubameyang would make Giroud surplus material and with the 2018 FIFA World Cup fast approaching the 31-year-old needs playing time to make France’s squad. An experienced striker Giroud would offer Dortmund an immediate solution up-front. Furthermore, the French forward is both a gentleman and a true professional, who could guide Dortmund’s young guns. At 31 he is, however, no long-term solution and at most—should Dortmund op to purchase him rather than loan him—would have another two or three seasons of top-class football left in the tank. There is another downside to signing Giroud now; the French forward would not be eligible for the Europa League. The last two years it seems that in every transfer window Fedor Smolov was a hot topic in Dortmund. This winter all the talk has been about West Ham United, but his agent has publically stated on twitter that Smolov is also looking at other options. 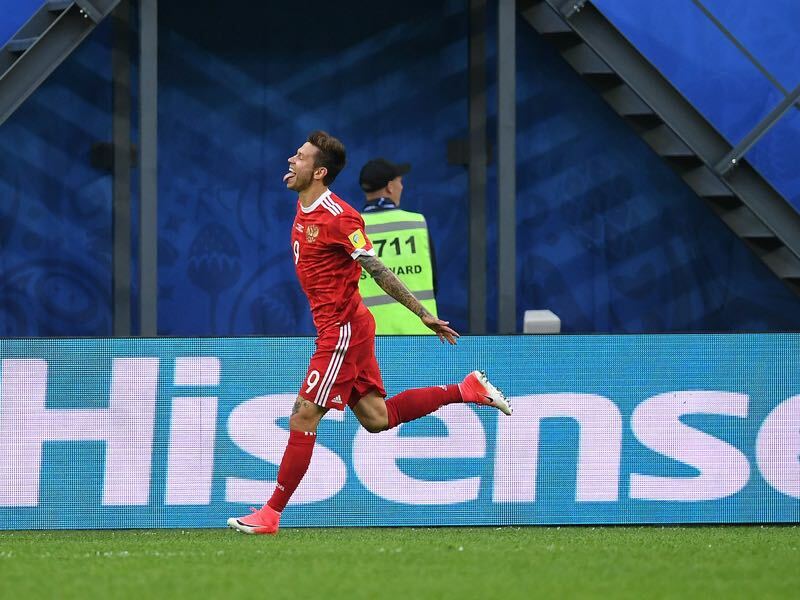 Last summer at the Confederations Cup Smolov was very open about wanting a move to Borussia Dortmund, and the Futbolgrad Network has learned that his opinion has not changed. Hence, like it was the case with Andriy Yarmolenko a long-lasting transfer saga could finally see Dortmund be united with the player that they have been linked with for the last 18-months. Aged 27 Smolov is not only younger than Giroud but also younger than Aubameyang. The Russian striker also has a fabulous goalscoring record in the Russian Football Premier League and although not quite as fast as Aubameyang is much closer fit to Aubameyang’s playing style. Unlike Giroud Smolov also drops deep, is very fast, and because he started his career as a left-winger can play multiple positions up front. The one caveat is perhaps that like it is the case with Yarmolenko adaptation to the Bundesliga might take some time, and Dortmund needs a forward that can replace Aubameyang right away. After scoring six goals in 22 games during the 2016-17 Primera División, the 20-year-old forward has continued his good form this season with four goals and two assists in seven league games. Martinez was also deadly for Argentina’s U-20 side scoring seven goals in 11 games throughout his entire career. The forward has been linked with a move to Atlético Madrid, but a deal fell through, and he is still on the market. Dortmund are linked, the problem, however, is that Martinez would be another prospect. 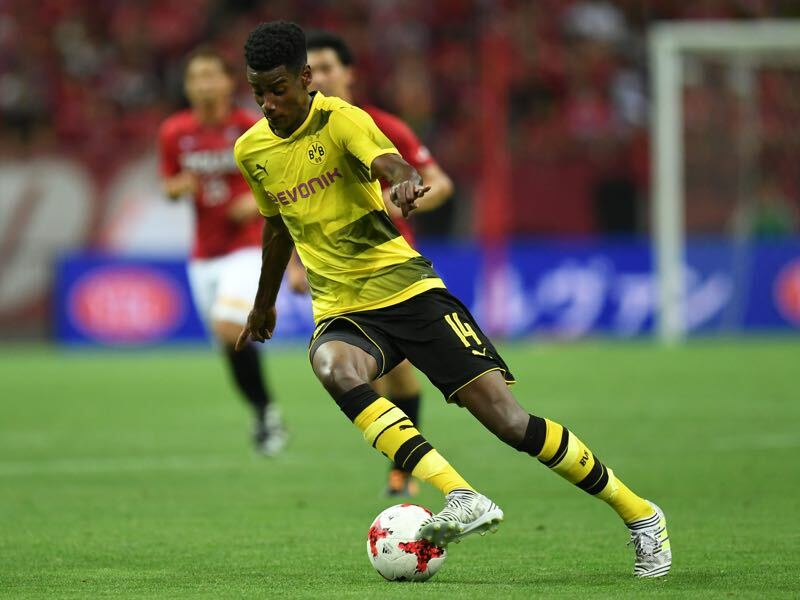 Given that Dortmund have already the likes of Alexander Isak, Christian Pulisic and Jadon Sancho in the side the feeling is that BVB need to bring in a more experienced forward to compensate the loss of Aubameyang. Replacing Aubameyang with just one player might be difficult. With the likes of Isak Dortmund might have an excellent prospect already in the squad. But should Aubameyang leave right now he would leave a gap of about 15 goals until the end of the season? Those goals might be difficult to replace with just a single signing. Everything might be pointing towards Giroud for the short-term, but the fact that the French forward cannot play in the Europa League and his advanced age makes it unlikely that he will be the only signing. With the €70 million that Dortmund will receive they might very well go down the path and sign two players for the position up front. This would also make sense tactically as it would allow Peter Stöger to be more flexible in his attacking formation switching perhaps to a 3-5-2, which seems to be the formation of choice in the Bundesliga, or even to a 4-2-2-2, which he used at times at Köln. With this in mind, Dortmund could become very busy once a deal for Aubameyang is agreed.